Don't buy if your phone doesn't support NFC in hardware. If you have any problem with how to operate,please feel free to contact me. Through the nfc radio frequency communication technology and mobile phone connection to the mobile phone function operation and sharing of data. Smart ring by touching the phone nfc signal area, to achieve the screen to unlock; application lock; quick start application; send read business cards, URL information and other functions. Touch unlock, hand wear ring touch unlock, screen lock, application lock set (some phones need to ROOT, can use the function).Lock / unlock the program, select the application you want to lock / unlock, write the smart ring, only the ring touch the phone to start the application, to protect personal privacy. 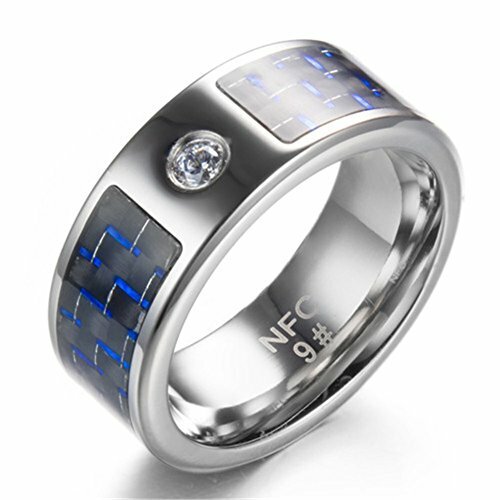 Touch the sharing / personal memorandum, you can store private content in the ring, you can also share the phone business card, wifi password, graphic information, etc., can also be used as a private memo to unlock the only way to unlock.No charge / depth waterproof, built-in ultra-sensitive DNF chip, no electricity to work, easy to wear. If you have any questions about this product by Mehoca, contact us by completing and submitting the form below. If you are looking for a specif part number, please include it with your message.